I started this blog because I wanted to learn some technical stuff about setting up a website. I learned something about that but I learned more than that. Composing posts forced me to try to capture the vague thoughts wandering around my brain and turn them into words. Putting those words on paper helped me to understand myself and my beliefs. This is a work in progress and the points above are just a first draft outline of my personal manifesto. Bill Shankly was wrong. Football is not more important than life and death; it’s just a game. I’m a Birmingham City season ticket holder and spend far more time thinking about the club than I should. But it is not the most important thing in my life; friends, family and faith would all come before football. Fans are just people. They are neither the scum of the earth nor perfect heroes. They come in all sorts of shapes and sizes, with the same range of personalities as is found in society in general. At one stage I considered making this a purely football blog and leaving out the occasional posts on books or life in general. I decided to keep the other topics as an indication that I am not defined by being a football fan; I am a complex human being with beliefs and preferences in all areas of human existence. What is true of me is true of all football fans. Some fans are intelligent and thoughtful; others behave like mindless idiots. The problems that arise at football matches are the problems found in society. Football doesn’t cause violence; it is just one area where the violence in our society is displayed. 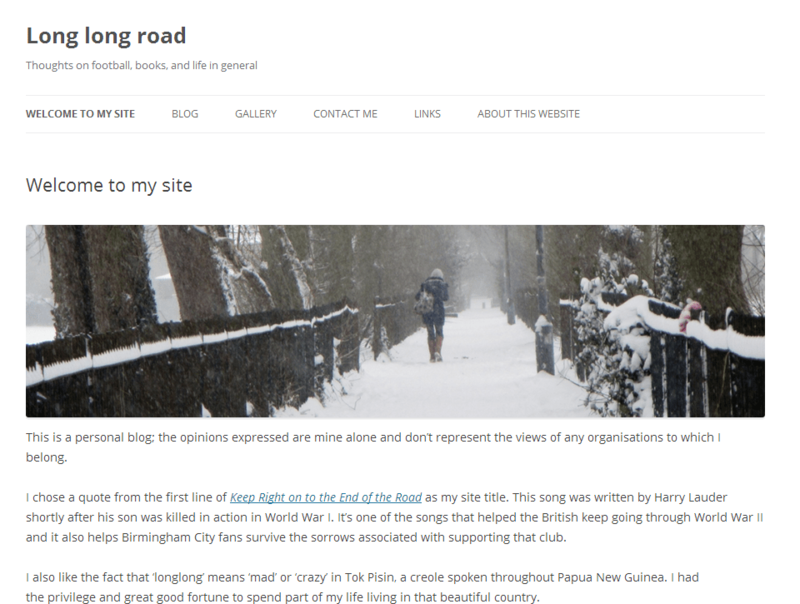 Can Birmingham City fans work together? I hope so but there are a lot of different Blues fan groups and it probably isn’t going to be easy to get them all working together. (I’m going to have a think about this and possibly write a separate post on it.) We also need to work with fans of other clubs on issues that affect us all. Fans also need to work with the club: what’s good for the fans is good for the club. When a club listens to its supporters and tries to give them what they want then attendance and sales will go up. Clubs can’t deliver everything their supporters want; they can’t guarantee more goals and more wins. But they can improve the match day experience if they are willing to listen to fans and try to do something about their concerns. That sums up what I’ve learned about my own beliefs so far: here’s a couple of things that I learned about running a blog. Any comment that says, “Your blog is the best I’ve ever read.” is spam. Real people may say nice things but usually make some reference to the topic you’ve written about. Spam comments far outnumber comments from real people. Good ways to attract readers are to have a poll or mention the Villa. My poll on what sort of owner fans want generated the most interest (529 pageviews, 461 unique). My next best read post was the one on why I don’t hate the Villa (454 pageviews, 432 unique). Since I installed Google Analytics on April 5th, over 4,000 unique visitors have visited my site and there have been over 10,000 pageviews. I know these numbers are miniscule compared to well-established blogs but they have encouraged me, newbie that I am. Keep up your good work usually interesting and informative.